Nowadays people spend a lot of time looking at screens and pressing buttons. Children lack live games in which they could create stories themselves and move the characters directly by holding them with their fingers. Funny Animal Theatre makes this possible. It is a truly developing and training toy. The characters of the children’s theatre are lovely animals that become alive with a slight movement of the hand. Just put your child’s fingers in the toy and move them a little, and the funny hero is here, ready to play. Each funny animal has its own personality: are called “Toddlers”. Together with your child, they learn how to communicate and behave correctly in different real situations! “Toddlers” are animals operated by fingers. They can walk and run. Funny animals are great assistants for studying the art of theatre performance. Theatre games with “Toddlers” create an emotional uplift, raise your child’s vitality and help him to develop his personality. Funny animals are unique for the development of a child’s imagination, thinking and figurative speech. They activate information processes and improve manual dexterity that allows the child to control his movements better! Lifetime: 5 years from the start of use. Put the skill-trainer on your fingers, as shown in the picture. Now teach the baby elephant to move. This playful exercise will assist in the development of fine motor skills and hand coordination. The baby elephant can walk, run, sit down on its rear legs, play football, raise different objects with its trunk, turn a ring with its trunk, and perform other tricks that the child can invent. 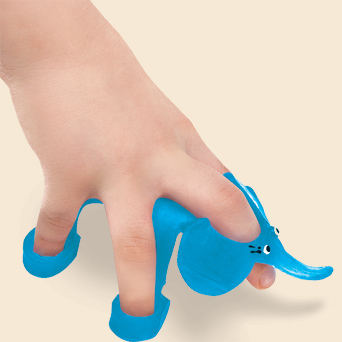 Made of soft and flexible material, the Toddler Baby Elephant easily fits on the five fingers of the child’s either hand. After the child plays for a few weeks with the finger trainer, you’ll be surprised how strong his hands become, how quickly he writes, and the stamina and dexterity with which he performs complex tasks with small objects. The Toddler Baby Elephant is a 3-in-1 game: an intelligent finger trainer, a tabletop game, and a travel game. Recommended for children aged 3-7 (for right and left hand).